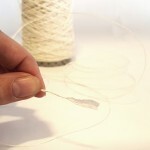 50g cones of smooth, white pure paper yarn for experimental textile projects. 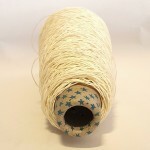 Deckle is a pure paper yarn with a multitude of craft possibilities. It has a smooth character with a slightly textured surface. It has been spun into a fairly strong yarn that can be dyed or painted or used in this nice ivory shade just as it is. 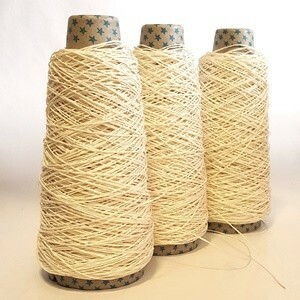 Paper yarns (sometimes known as Washi yarns) have their tradition in Japan and are used mainly to weave into fabrics for all types of applications including garments. Though not the most practical of fabrics you might think, paper it is both hygienic, breathable and light. 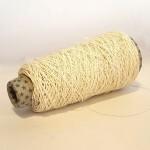 Due to the density of fibres, paper yarn collects neither dirt nor dust - an important property for allergy sufferers. As these yarns and fabrics are evolving they are being used by fashion students and designers to create crisp lines and sculptural forms within their work. 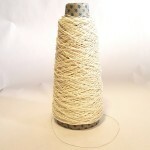 Spun yarns are the ultimate paper yarns for weaving as they are fairly strong and can be very fine. Use a contrasting yarn as a warp, such as a similar thickness of linen or silk, and weave the paper in the weft. We have seen it woven into placemats, bags, runners, baskets and vessels. Knit and crochet into sturdy bags and baskets, jewellery (bangles and beads) and accessories that have brilliant stitch definition and need no starching or sizing to keep a rigid finish. Wrap or twist the dyed yarn into unique beads and of course it can be glued to hold its final shape. 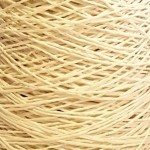 As you can see from our images, paper yarn has no drape or elasticity at all and is quite wiry. It is strong enough to be wound through our machines, though we suggest using by hand or for weaving in the weft where it doesn’t have to endure too much tension. 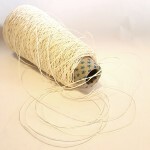 Plying with another yarn will give both a decorative finish and increase its strength. As with our other undyed yarns, paper yarns can be dyed with cold water dyes using tools and equipment you would have in your kitchen. Paper can be painted or dipped and it getting wet should pose no problems. Use procion or fibre reactive dyes and it can also be dyed with natural dyes – into solid or unique space-dyed colourways. These small cones mean you can experiment without blowing the budget to create something unusual and unique.